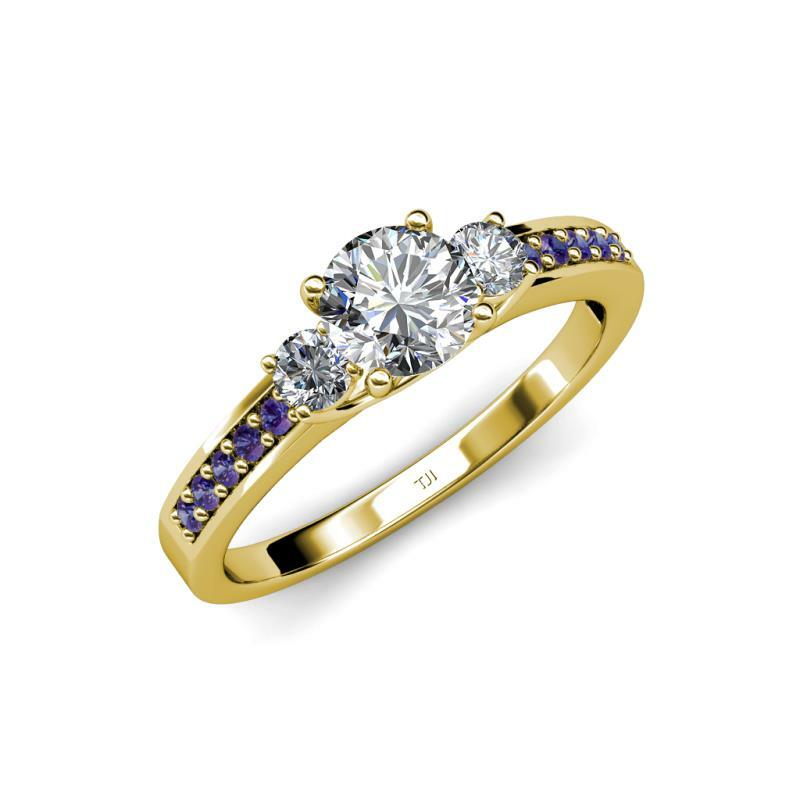 Diamond Three Stone with Side Iolite Ring Sweetly express how much she means to you with this Engagement Ring which signify your past present and future with Center Diamond and Side two Diamond while 10 Round Iolite accent the sides making it a glistening gift of Love. Condition: $7929 New In stock! Order now! Order in 1:57 hrs to get it by 26th Apr 2019 with Overnight Delivery Learn More. Normal processing time for this item is 3 to 4 business days before it ships and it will ship via your chosen ship method after the processing time is complete. 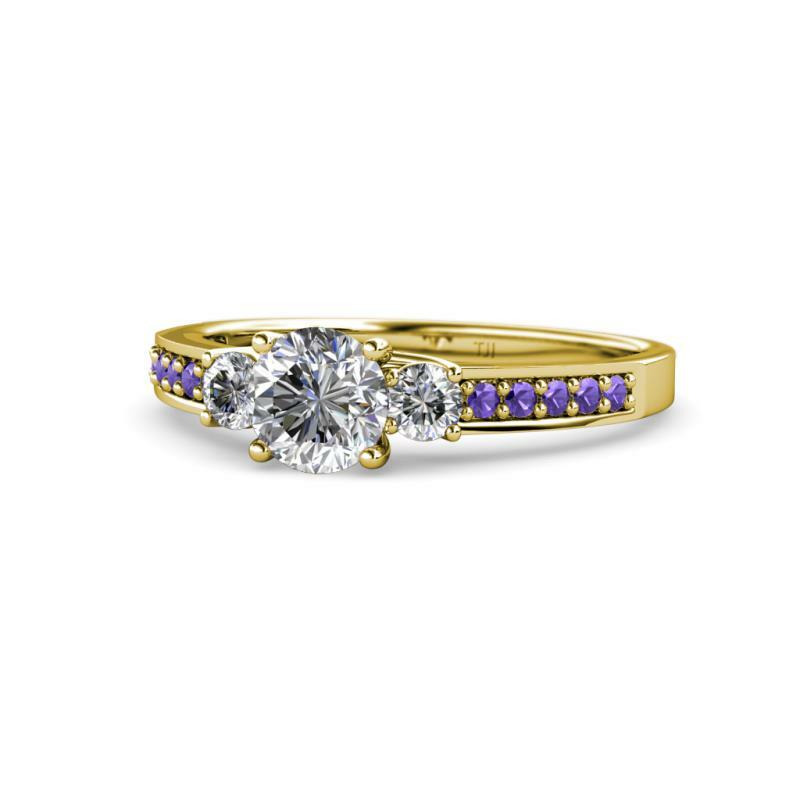 Sweetly express how much she means to you with this Engagement Ring which signify your past present and future with Center Diamond and Side two Diamond while 10 Round Iolite accent the sides making it a glistening gift of Love. It has Center Diamond of 1.00 ct flanked with two dazzling Diamond of 0.32 cttw and small side Iolite of 0.13 cttw, total of 1.45 cttw. 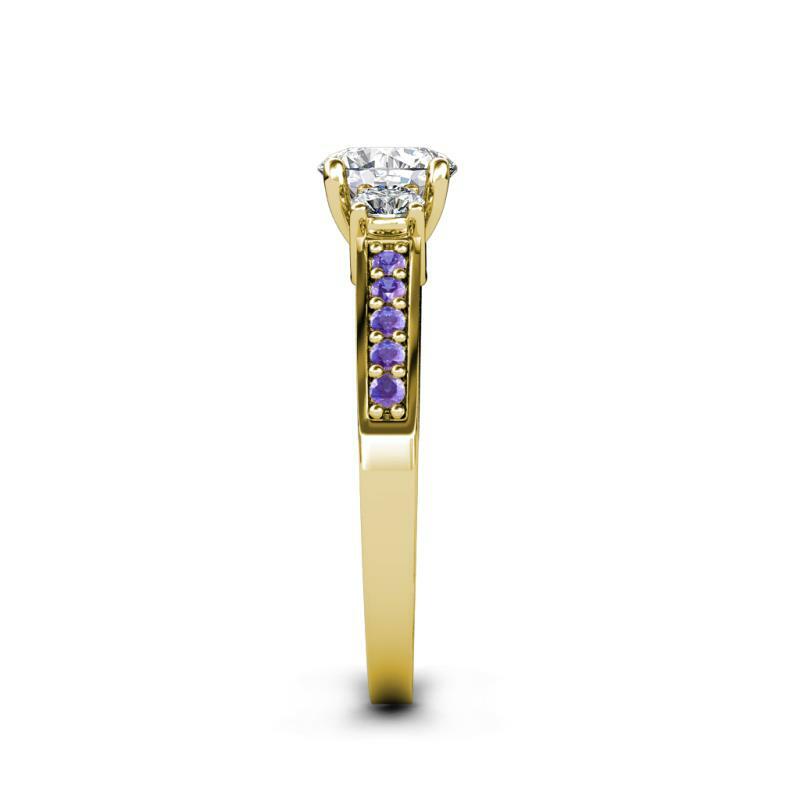 3 Round Diamond and 10 Round Iolite set using Prong Setting. 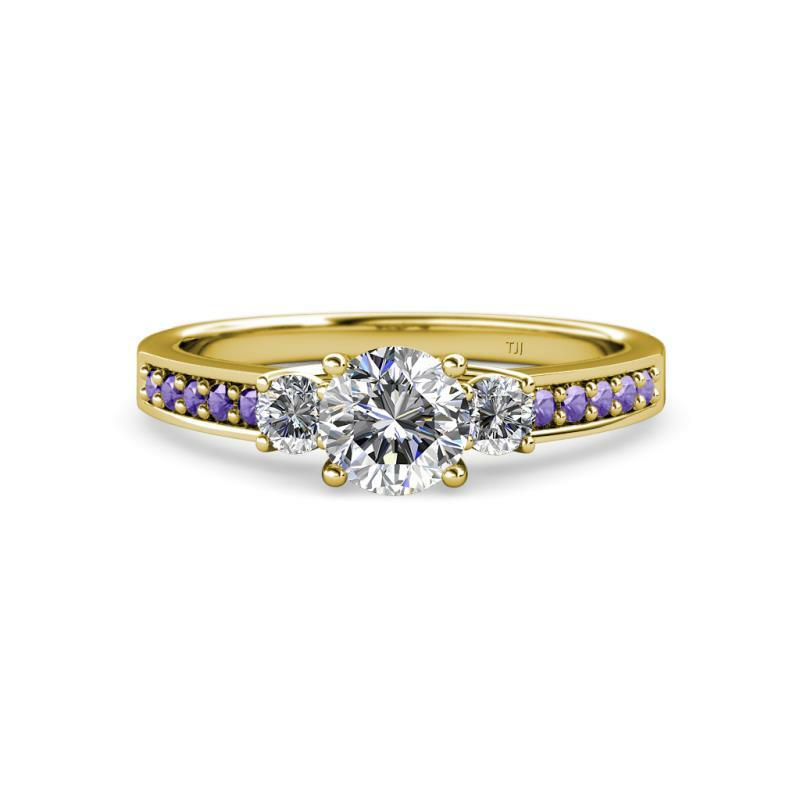 SI2-Clarity, G-Color Diamond & SI1-SI2-Clarity, Violet-Color Iolite. Gemstones may have been Treated to Improve their Appearance. The Image may show Slight Differences to the Actual Stone in Color & Texture. Natural Properties & Composition of Mined Gemstones define the Unique beauty of each Stone. All our Diamonds to our Best Knowledge are not Conflict Diamonds. Made in America From the World’s Finest Materials. Vijay is an amazing person to work with. Honest, sincere, caring, and responds in the most timely manner that I have ever experienced while purchasing goods online. Never tried to upsell or anything of the sort but rather gave me the best possible deal that I could find from any site. Looked at comparable rings on other jewelry sites.. etc. but his prices were better and customer service was impeccable. Texting me pics of different diamonds, gemstones, and prices and keeping me in the loop throughout the entire process. Ultimately ended up going with .75 ct diamond center with .35 ct swiss blue topaz (Birthstone) on either side. Also was in a time crunch as I needed it before our trip to Thailand, and although I ordered it relatively late, Vijay made sure I had it in my hands 2 days before I left. Amazing quality, stunning diamonds and gems, and the best customer service you will find. Will recommend to everyone. Truth be told, we had some issues with the ring, but ViJay consistently worked and communicated with us. His continual reassurance allowed us to never once feel as if we were "taken." Ultimately, we received a newly constructed ring and are now 100% satisfied! Vijay is the best! 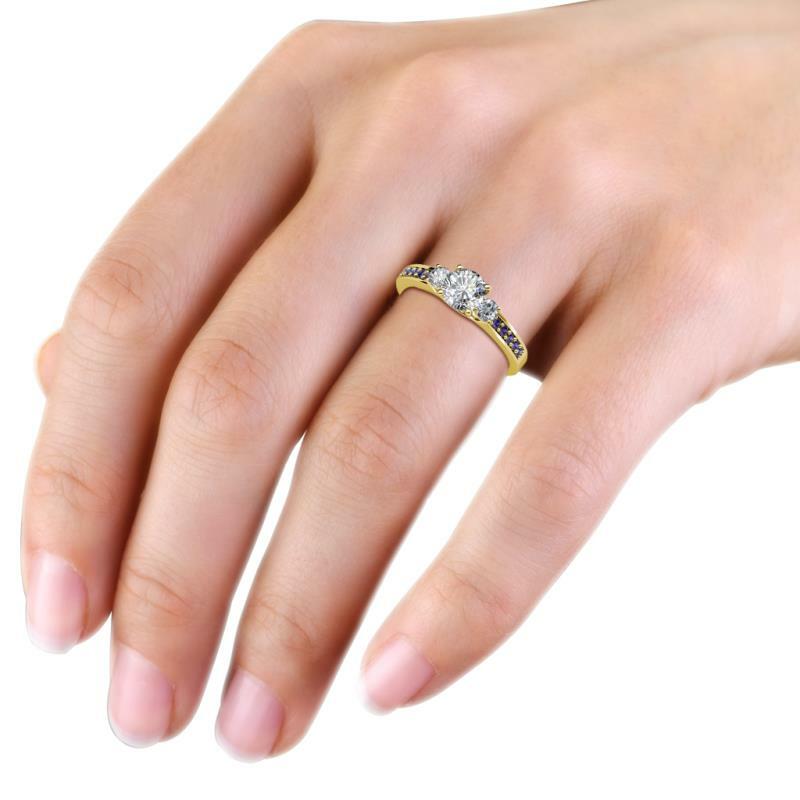 I purchased this ring for my girlfriend and a few hours later I get a personal call from Vijay, where he introduces himself and assures me that I will get a beautiful ring to propose with. He guided me on every aspect of the design and progress as it came along. My girlfriend is not my fiance! She couldn't have happier with the ring! We had to get the ring re-sized, as my fiance lost some weight since the last time her finger was sized. We got it back to Vijay, just to make sure it was done right, and we got it back within the week... it is perfect! I would 100% recommend Vijay and Trijewels. i got this after searching for weeks for a ring with a tri stone setting with garnets (my fiances birthstone). i finally found this ring from trijewles and it was perfect for a great price. the staff was very helpful and walked me through the process. Enter a few pieces of information for a real-time decision. Checking your eligibility won't affect your credit score. Know up front exactly what you'll owe, with no hidden costs and no surprises. Subject to credit check and approval. Down payment may be required. For purchases under $100, limited payment options are available. Estimated payment amount excludes taxes and shipping fees. Affirm loans are made by Cross River Bank, a New Jersey-chartered bank, Member FDIC. See www.affirm.com/faqs for details. With few quick questions Submit your application and be up and running. On instant approval by PayPal Credit you can complete your order. PayPal Credit, a PayPaltm service, is trusted by millions of customers and accepted at thousands of stores. Gain flexibility and control. Pay now or later – the choice is yours. Checkout is faster. No credit card required. It's safer - and more secure. Eligible purchases are backed by PayPal purchase protection. Yes I would recommended this to a friend. No I wouldn't recommended this to a friend. Copyright © 2019 TriJewels. All rights reserved.